We started off with some sweet photos in his nice outfit with just a simply background. He wasn’t so sure about me and then my tried-and-true trick to get smiles ended up making him cry! I guess there’s a first time for everything. But I think he warmed up a little when I got him a toy train to hold. He even flashed a few quick smiles for me which I’m excited to show his mom. 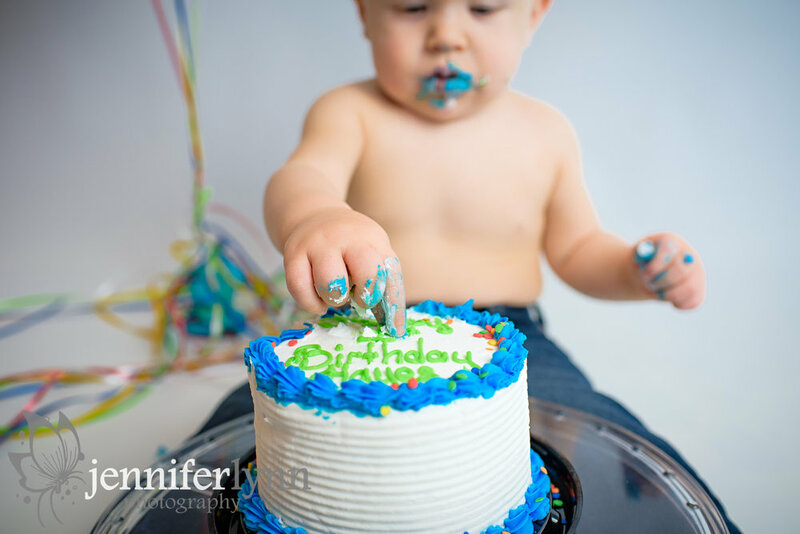 We finished up the session with a cake smash very similar to his older brother’s. I just love how simple it is to have a kid, cake, and balloons. Hayes MUCH preferred his balloons to the cake, so we did about half before the cake with him just laughing and bopping the balloons around. He was quick to try the cake and the icing, then very decidedly said he was done. His mom said it will be easy to tell his photos apart from his brothers as they had such different reactions to cake! You gotta love how siblings can be so very different! A big thanks to his parents for coming back for this fun session with Hayes! I loved seeing you again and meeting your fun little guy.